This page contains information and pictures about Red and Blue Beetles that we found in the Brisbane area, Queensland, Australia. This beetle also known as Pollen Beetles. 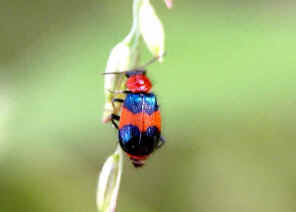 The beetle is bright red in colour with four metallic blue spots on the elytra. The above pictures were taken during mid summer. This species of beetles are partly predacious. They search over plants during the day. They eat eggs, larvae and other slow-moving insects. 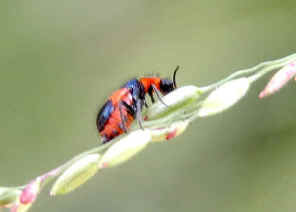 On rice crops, they have been found feeding on pollen. The egg, larval and pupa stages are in the soil. The above photos show a female. Male has the antenna 3rd segment enlarged. We thought this was a Leaf Beetle. Douglas LeDoux from Columbia sent us email advised that this should be a Melyridae. Then we narrowed down it is a Dicranolaius bellulus. 1. Dicranolaius spp. - Australian Insect Common Names, AICN version 1.53, CSIRO 2005. 2. A guide to the Genera of Beetles of South Australia Part.6 - Matthews, E.G. 1992, Fig110. 3. Insects of Australia, CSIRO, Division of Entomology, Melbourne University Press, 2nd Edition 1991, p 647,Fig35.45C. Last updated: January 01, 2009.